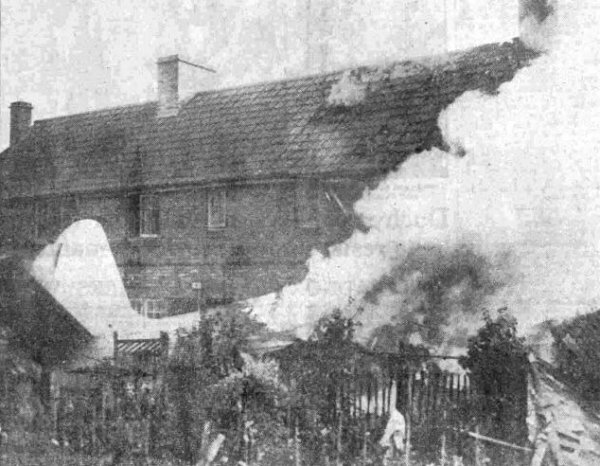 On Monday 31 October 1949 a semi-secret jet 'plane crashed on council houses in Yeovil killing three people and seriously injuring a fourth. The aircraft was a paraffin-fueled Westland Wyvern TF.2 prototype Naval strike aircraft. The Wyvern was a single-seat carrier-based multi-role strike aircraft built by Westland Aircraft that served in the 1950s, seeing active service in the 1956 Suez Crisis. Production Wyverns were powered by a turboprop engine driving large and distinctive contra-rotating propellers, and could carry aerial torpedoes. 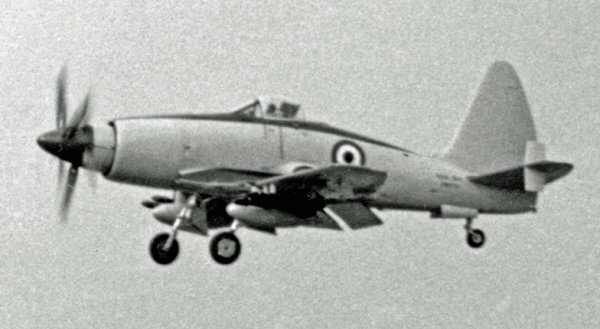 The first flight of a Wyvern was on 16 December 1946 and the later development prototype, the TF.2, first flew on 18 January 1949. The Wyvern entered service in 1953 and was retired in 1958. The TF.2 was on the secret list until April 1949 and at the time of the crash performance and certain other details were still on the secret list. The following is an amalgamation of several newspaper articles from across the country describing the disaster. 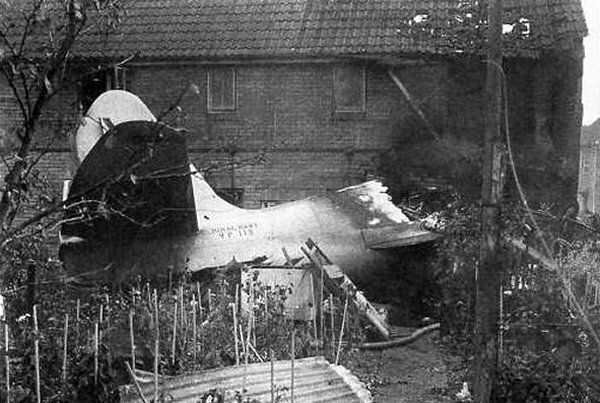 A semi-secret Westland Wyvern turbo-jet fighter prototype crashed on two semi-detached council houses near the Westland aerodrome at Yeovil. The pilot, a six-year old girl cycling on the road and a woman were killed. Another woman, who had been trapped in her blazing house, was rushed to hospital after a dramatic rescue. The pilot was the Westland Company's assistant chief test pilot Squadron Leader Michael Graves DFC, aged 28, son of Sir Cecil Graves, a former Director General of the BBC from 1942 until he retired because of ill-health in June 1943. 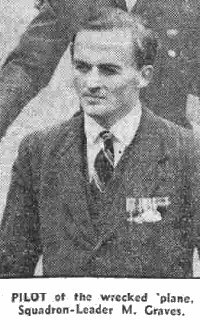 Squadron Leader Graves, who had been with Westland Aircraft for two years, was attached to the Middle East Command and had received his DFC in 1942 when he had a record, as leader of a fighter squadron, of three enemies destroyed, five probably destroyed, and many others damaged. The body of Squadron Leader Graves, who left a widow and two young children, was recovered from the debris after Naval men from Yeovilton Air Station, in asbestos clothing, had dug away part of the building and cut away sections of the wrecked fighter. The 'plane had been up for about half an hour on a routine test flight when it was seen to dive down out of control. A young apprentice painter, Henry Ford of Milford Lane, who was working on a house nearby, said "I saw the 'plane crashing, leaving behind it in the air a trail of burning fuel about 20 to 30 feet long." It struck the ground and ploughed through perimeter fencing and over 200 yards of waste ground separating rows of dwellings before striking the corner of a block of four houses and catching fire. An eye-witness said that the 'plane seemed to run across the runway "It appeared to blow up as it hit houses at ground level." Six-year old Anne Wilkins of 8 Westland Road was killed while playing on her bicycle with friends on the waste ground. Her friends scattered as the aircraft approached and escaped harm. A housewife, Mrs WG Brown, mother of seven children, was buried in the ruins of her home at 30 Westland Road. Her body was recovered by rescue workers after an hour's search. At first it was believed her sister might be buried in the wreckage, but it was later ascertained that she was elsewhere. A next-door neighbour, Mrs JW Hockey, was trapped by debris between the gas stove and a wall in her badly damaged house. Her clothes were alight when a fire officer rushed into the blazing premises, and a jet of water was played on her while attempts were made to release her. In the meantime, Dr JC McMaster, of Yeovil, who was accompanied by nursing sisters, injected morphia. All the electric power in the area was turned off while civilian and Naval firemen, together with police and neighbours, laboured amid the wreckage and flames. Mrs Hockey was freed about 20 minutes after the crash and taken to Yeovil Hospital. Her condition was stated later that night to be "very critical". Many thanks to Rob Baker for forwarding the newspaper reports to me. The Westland Wyvern TF.2 prototype Naval strike aircraft. 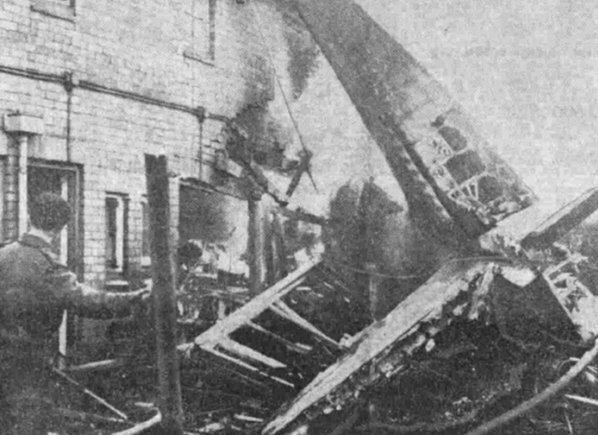 The burning wreck of the Wyvern, from a newspaper photograph. The scene of the disaster, photographed in the Western Daily Press 1 November 1949. .... and seen from a different angle.